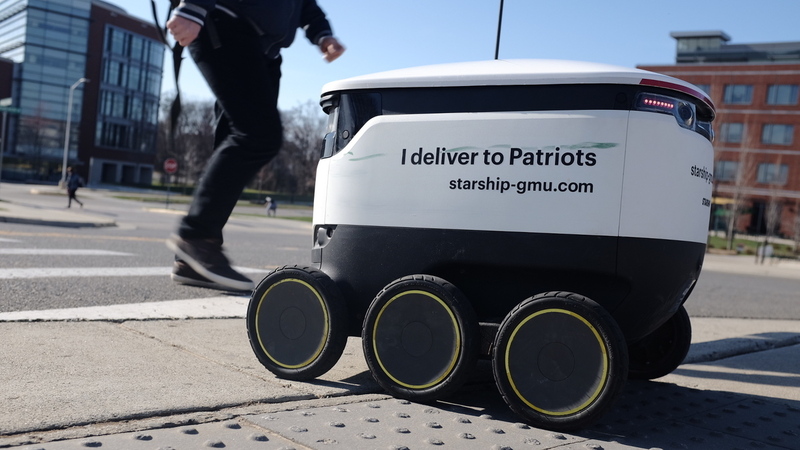 The Robots Are Here: At George Mason University, They Deliver Food To Students Several dozen autonomous robots roam the Virginia campus providing options such pizza and coffee. "We were amazed by the volume of orders," Starship Technologies executive Ryan Tuohy says. At George Mason University in Virginia, a fleet of several dozen autonomous robots deliver food to students on campus. Multiple colleges across the country have deployed delivery robots – including University of the Pacific in Stockton, Calif., and Northern Arizona University – but George Mason University is the first college in the United States to incorporate robots into its student dining plan. The school is partnering with food service provider Sodexo for the program. "We were amazed by the volume of orders that we had when we turned the service on," Starship Technologies executive Ryan Tuohy says. "But what's really touching is how the students on the campus have embraced the robots." Student Grace Pereira-Plaza says she finds the robots "pretty adorable" and at first students were obsessed with them — taking pictures, selfies, dressing them up for holidays. But they slowly got used to them. "We find it normal now, seeing them go by, it's like 'oh there they are,' " Pereira-Plaza says. How does it work? Students can place an order through an app for any restaurant that is part of the program. The cost is $1.99 per delivery. Then, they wait. The goal: a 30-minute delivery. And just like Uber, students can watch the vehicle as it travels toward them – at 4 miles an hour. The robot is equipped with nine cameras and ultrasonic sensors to navigate its surroundings. Humans are still needed to put the food into the robots and can monitor them from afar to intervene if there are any problems. But these are self-learning machines that can adapt. "They're working their algorithms that if they see a student start across the road they'll be right behind them," Mark Kraner, head of the school's retail operations, says. "So they are learning and it's fun to watch them evolve." Sometimes, there are unforeseen issues. At the University of California at Berkeley, one of its delivery robots caught on fire. And for George Mason University, during the first day of deployment, the robots had so many orders that school officials had to temporarily shut down the system. But overall, they are a positive addition to the school. Starship Technologies and Sodexo found that these robots have helped more students eat breakfast. An extra 1,500 breakfast orders have been delivered autonomously since the start of the program, according to a press release. And, while students at this university now expect to see the robots on a daily basis, for the rest of us, it might take some getting used to. NPR's Claudette Lindsay-Habermann and Andrea de Leon produced and edited this story for broadcast.